In this episode, Mikey refuses Archelomon's sacrifice and Christopher's help in fighting Neptunemon, but needs every lucky break to actually win. 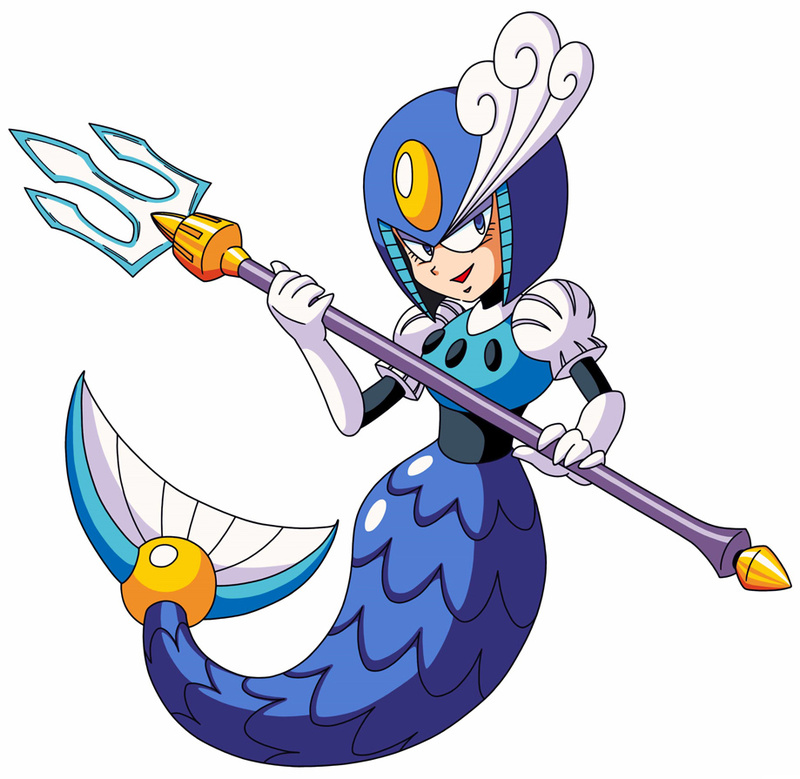 Neptunemon may be the boss of World 2, but he's never going to convince anybody that he's all that crucial to the plot. Despite the enormous army and respectable tactical maneuvers, he comes across as little more than one of the Robot Masters that only serve to stand between Mega Man and Dr. Wily (he does bear a passing resemblance to Splash Woman). Nobody believes that he has any real chance of actually beating the Fusion Fighters. It's safe to predict that Mikey will defeat him and move on to Fire Man. That's really all that happens here, and that's really disappointing. Everything else in the episode isn't all that consequential. Mikey's decision to stay and fight is stupid enough to merit discussion, but only reinforces a side of him that we're already well familiar with. The same goes for Christopher, who picks a better time to sell his assistance, but it's the same offer at a reduced price. It's not all that noteworthy that he decides to change tact at the end of the episode and just have Mikey do the dirty work for him. Which is basically what he wanted to enlist Mikey for anyway. Mikey could have made the episode even more inconsequential by skipping the fight with Neptunemon entirely. In fact, knowing that the code crown allows free zone transfer out of Island Zone, Neptunemon holding Archlomon hostage and throwing the kitchen sink at Mikey was a strategic miscalculation. If Mikey deems the situation unwinnable and skips town, Neptunemon's mission ends in failure and all he'd get out of it is a month's supply of turtle soup. Thankfully for Neptunemon, Mikey's programming does not allow him to skip town There's no sense weighing how bad a decision this is, because it didn't feel like Mikey made a decision at all. 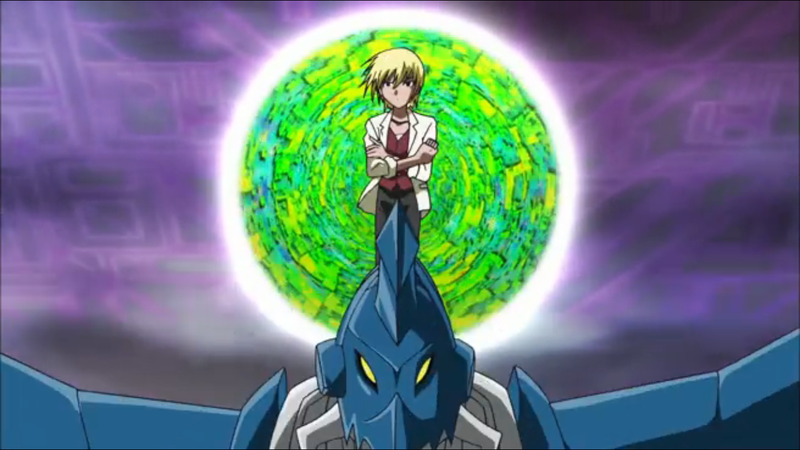 It didn't matter how much Archelomon pleaded Mikey to leave, how many of the Digimon deemed the situation hopeless and how easy it would have been for Mikey to save ChibiTortomon and the others by enlisting them into his army. Mikey was either going to stay and fight (stupid) or cave to Neptunemon's demands (unfathomably stupid). In this context, it's a major character flaw, and it's way too early in the series for him to be overcoming major character flaws. He doesn't get a pass for taking the stupid path, but it isn't as egregious as Takuya not killing Nefertimon in Frontier. That still pisses me off. If Mikey was to triumph through a combination of ingenuity and his team's collective power, then bring it on. If he was to falter, surviving only by miracle intervention and learning an important lesson about discretion and making hard choices, he'd be way ahead of the game. Instead, we get the worst of both. Mikey triumphs, but only by not one, but four strokes of good luck. Christopher and MailBirdramon take out most of the Seadramon as a free trial before Mikey passes on the paid subscription. Mikey again has absolutely no clue what these digicards do and to picks MarineAngemon because he has “marine” in his name, a choice which only pays off in an unconventional way. Dorulumon decided to shun established zone transfer physics to vacation in Island Zone, putting Shoutmon X3 (and the ridiculously cheap X4) in play. KingWhamon bails them out yet again. Mikey has a couple of good moments, but he doesn't recognize the good fortune that was decisive in his victory. He'll move on to the next zone, thinking he played everything right, not realizing that he totally got away with this one. There has to be a point in the future when he won't. Once again, MailBirdramon seems totally on the same page with Christopher. What could be interpreted as abusive, both seem to recognize as a mutual pursuit of strength. Even Neptunemon seems annoyed by the slow pace of this episode. His impatience might be the most entertaining part of it. It would be really nice if Jeremy was a little more vocal in his disagreement. He's one of the first to encourage Mikey to bail and his enthusiasm in the final decision is lacking, but there's no conflict in shrugging and going along with it anyway. Christopher asks Mikey to turn over his digicards, but looks confused when Mikey actually pulls them out. Perhaps he expected them to look less like memory cards and more like collectible trading cards. Speaking of Tamers, MarineAngemon contributes way more to a fight here than Kenta's partner ever did, but Kenta's MarineAngemon remains so much better for so many reasons. And for that matter, why does MarineAngemon get to be a digicard and not Terriermon or Renamon? At least Guilmon gets one later. Seriously? Such a decisive power surge between X2 and X3... and adding the sword that we've seen practically every episode constitutes X4? Try harder. This review was pretty much what I was expecting. It's a pity as well, because the dilemma at the beginning could have been really interesting if they'd gone the dark route and had Mikey's team escape at the cost of Archelomon's life. Or even better, one of the other kids could take the code crown and drag Mikey away from the battle in the hopes of getting home faster. At least MarineAngemon was hilarious, and getting Neptunemon to impale himself was a clever tactic. Do they ever explain how Digimon can pass through the space between zones. 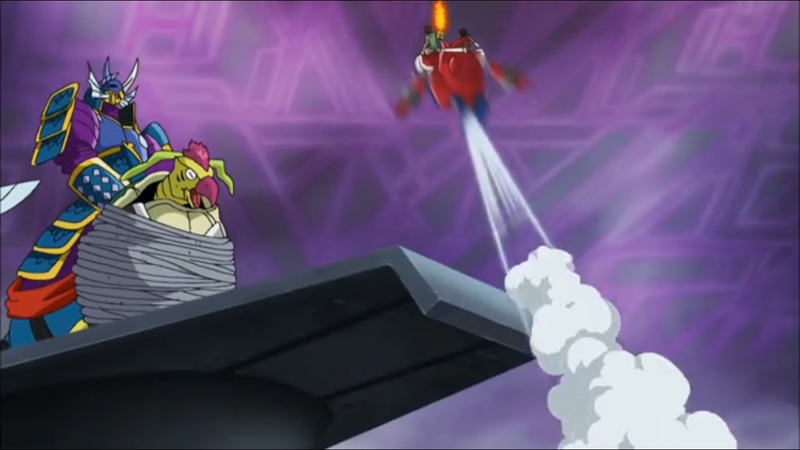 In one episode (I forget which), Jijimon steps out of the fusion loader, but then has to get back in before he evaporates. 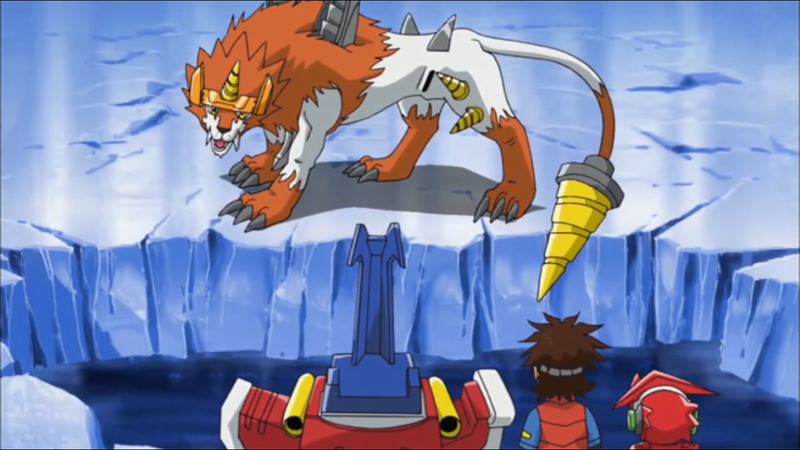 He says that's why they need to travel in it, but then what of Dorulumon and the Bagramon army? "He doesn't get a pass for taking the stupid path, but it isn't as egregious as Takuya not killing Nefertimon in Frontier. That still pisses me off." Oh no, I contend this episode is much worse than that one. Stupid as the Frontier version was, the episode under discussion didn't hold back on its calamitous implications, and outright kicked Koji and Takuya for their tactical self-immolation. It was stupid, but the heroes there paid the price for that stupidity. This Fusion version doesn't even have the brass balls to go there. It starts with a promisingly dark dilemma, puts the team in an unwinnable position where they're conflicted, and then promptly chickens out and hands Mikey victory on a platter. Any resistance from his own team melts away, lucky break after lucky break denies the hard choice and shields him from any consequences, and he doesn't learn a thing from the experience. What's worse is that Mikey's insistence on helping Archelomon should have been a tremendous strategic shortcoming that this episode raps him over the knuckles for, and instead fate throws enough curveballs to enable him to pull it off without any genuine compromise. Lame. The other major problem is that it shows something is seriously wrong with Mikey's narrow-minded samaritan syndrome in this episode, yet pretends otherwise. At least Koji and Takuya tried to defend Nefertimon while refusing to kill her, acknowledging if not actually understanding the importance of keeping the world safe. Mikey outright says he'd chuck the world on the fire if the alternative was abandoning a friend in need. THIS is supposed to be our hero for the evening? Fusion Episode 08: Meltdown in the Magma Zone! Fusion Episode 07: Danger Erupts!